Computer is becoming slower due to Windows updates and various temporary files on C drive. Fortunately, transfering unused space from D drive to C drive can solve the problem. Unused space in a partition is also called free space. It is a segment of capacity space of a partition which is not in use. It is the rest storage space of a partition. When the user’s partition configuration becomes unbalance, they hope take full use of other partition’s free space to expand the partition whose space is not enough. Most of computers are only given one partition on the hard disk; most of the users create more partitions to store data separately. Because if you store all your data in one partition, when the partition is damaged, all the data on it will be lost and no baby wants this trouble happen. In a short time, you are extremely satisfied with your partition mode. However, with time goes by, the unused space of your C drive isn’t enough due to temporary files, applications, cache, rubbish files and so on. Low unused space on your C drive can directly affect the performance of your computer, indirectly, you will have bad mood and can’t concentrate on your own work. For a long time, you may crazy about the trouble causing by your computer. Maybe you can uninstall some unused programs to gain free space. Unfortunately, after a long time the same problem will be met by you again. Therefore, system C drive is essential for computer users. When it is lack of free space, you must take some measures to extend it. How to Transfer Unused Space from D Drive to C Drive on Sever? 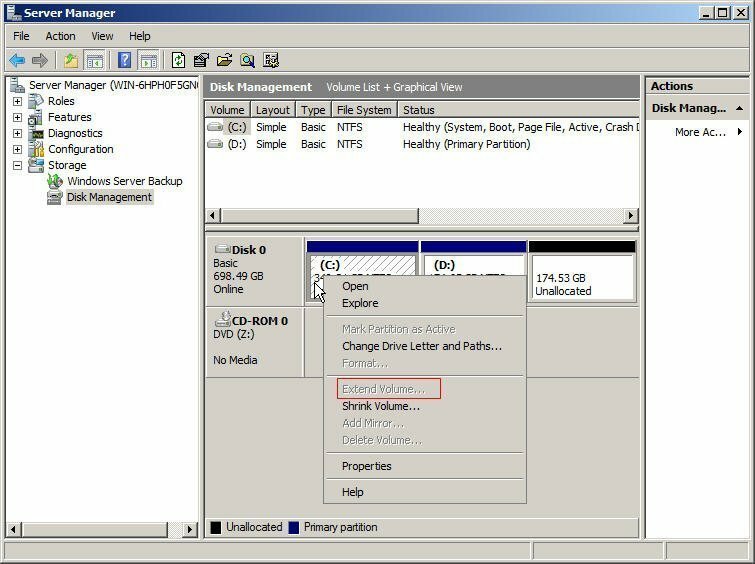 Windows Sever has a tool called Disk Management which can help you manage your partition. the new features in Server 2008 and 2012 called shrink or extend partition can help you expand or decrease the size of partition. With the feature of Extend Volume, you can extend C drive with the free space of D drive. But sometimes the feature is grayed out. Because this function is only valid when there is unallocated space adjacent to the drive which you want to expand. Besides the limitation, there is no Extend Volume in Windows Serer 2000 and 2003. These users can’t use Disk Management directly to allocate free space from D drive to C drive. What can they do to solve the problem? This server partition software is designed to small and medium sized business. With its powerful features such as allocate free space, merge partitions, convert dynamic to basic disk, migrate system to SSD and more features can help you manage your partitions without losing any data. The all-in-one software satisfies nearly all the needs for your partition. How to use AOMEI Partition Assistant to Transfer Unused Space from D Drive to C Drive? You can only allocate the free space from one partition to another. Besides, the allocated space should be less than or equal to the unused space of source partition in size. You can avoid distributing overloading unused room by taking reference of the size number listed on the main interface. Step1: Download, install and launch the software. Right-click D drive and then select Allocate Free Space. Step2: Type the size of free space which you want to transfer from D drive to C drive, and click OK. Then click Apply to commit the operations, you will see the free space has be added to C drive. The software makes you extend your C drive safely in simple ways. Furthermore, besides Windows home versions, the software can work on Windows Server 2003, 2008, 2012 R2. There is no limitation for your OS. Compared with Disk Management, this software make you manage your partition freely and all the Server users can benefit from its powerful features. Furthermore, the visual interface can help you finish your task easily. It’s a good choice for your partition.